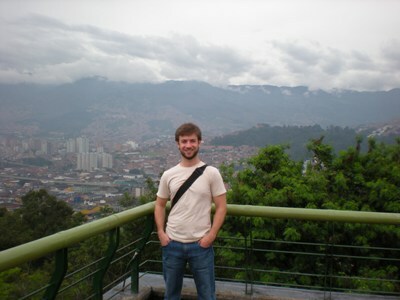 It’s not always best to try to fit in too much in a small amount of time, but with only a couple of days in Medellin I really had no choice, although I did feel like I saw alot. Bright and early Monday morning I hopped on Colombia’s only inner-city train system, Medellin’s Metro Line, and headed south to the Metrocable, an extension of the train system which are actually cable cars heading up into the outer barrios of the city and back to the train. Kind of like Disneyland’s, but fewer colors (and much cheaper). From here you really get one of the best views of the city. As you look out across the cityscape you can see the clouds in the distance rolling along against the hills, making the tops of the hills look like they’re floating over the city valley. 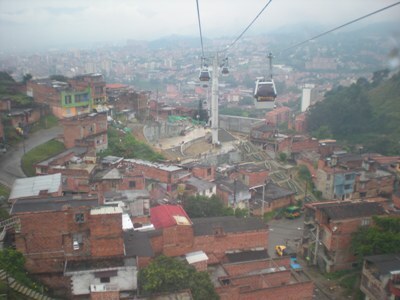 Next I headed to Cerro Nutibara, a small hill near the center of the city where there’s a re-creation of an Antioquian village (Antioquia is the name of the state where Medellin is located). On the topic of Antioquia, the word on the street was that they’re some of the nicer people in Colombia, which I couldn’t agree with more. From the employees to the random people I met, they were all extremely friendly and seemed like they really wanted to know what I was trying to say, even in my broken Spanish. Anyways, I finished up the Botanical Gardens which has this giant, alien like structure plopped in the middle of the complex which, from what I can tell, really doesn’t serve much of a purpose other than allowing for some pretty cool pictures (see below). 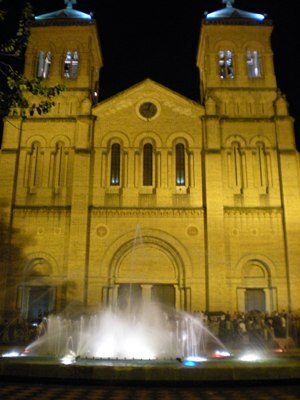 I finished up by hopping on a plane north to the Caribbean coast to the town of Santa Marta, just outside of Cartagena, which is where I am today, and which is where there’s also a massive rain system as well. So much for heading to the beach and trying out snorkeling for the first time. Hopefully I can get out there tomorrow, otherwise the extent of my encounters with water this trip are going to be limited to the flooded streets here in town. 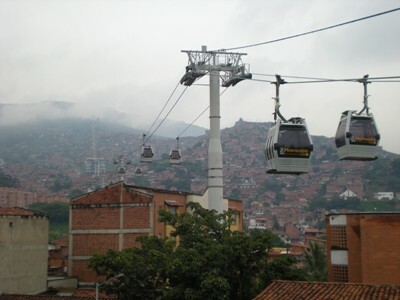 Here are the cable cars heading into the hills of Medellin. Probably one of the cooler attractions that’s really not an attraction (and even better, the ride is included in your Metro trip). 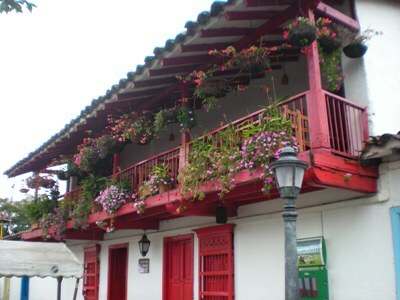 A balcony in Pueblito Antioquian. 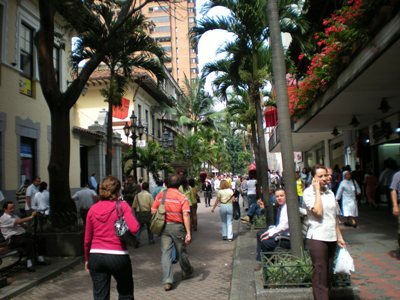 Medellin city street (this is by far one the less chaotic ones). See, I told you I wouldn’t be able to keep from doing another pictures of food. 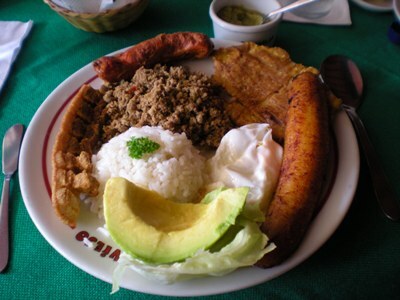 Anyways, this is a typical Antioquian meal, consisting of such healthy items as rice, ground beef, fried plantain, sausage, avocado, and various fried pork items from areas of the pig I probably haven’t even heard of. 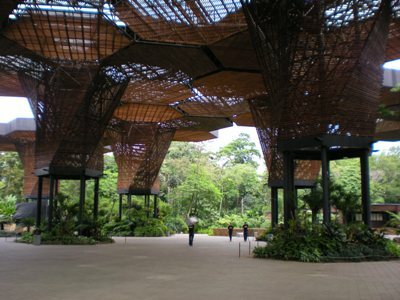 Here’s that really cool structure in the middle of the Botanical Gardens. 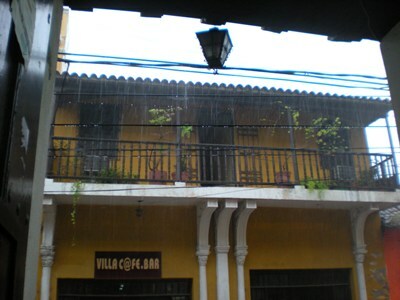 If you can’t tell what those are, those are massive raindrops falling in Santa Marta (taken this morning). Sigh.